Dysmenorrhoea or “painful periods” is the most common of all gynaecological symptoms. It is generally described as a crampy lower abdominal pain, which starts at the onset of menstruation. Primary – menstrual pain occurring with no underlying pelvic pathology. Secondary – menstrual pain that occurs with an associated pelvic pathology. In this article, we shall look at the risk factors, clinical features and management of primary dysmenorrhoea. In the absence of fertilisation of the egg, the corpus luteum regresses, and there is a subsequent decline in oestrogen and progesterone production. Spiral artery vasospasm – leading to ischaemic necrosis and shedding of the superficial layer of the endometrium. Primary dysmenorrhoea is thought to occur secondary to the excessive release of prostaglandins (PGF2α and PGE2) by endometrial cells. 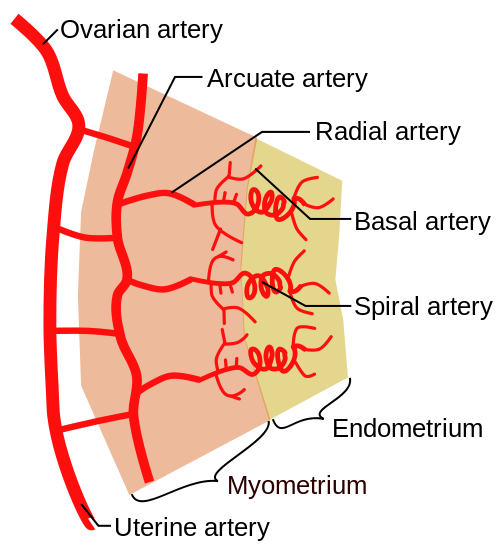 Fig 1 – Vasculature of the endometrium. The spiral arteries undergo vasospasm in response to prostaglandins. The typical description of dysmenorrhoea is lower abdominal or pelvic pain, which can radiate to lower back or anterior thigh. Pain is crampy in nature. It usually lasts for 48-72 hours around the menstrual period, and is characteristically worst at the onset of menses. The pain can be associated with other symptoms, such as; malaise, nausea, vomiting, diarrhoea, dizziness. Abdominal and pelvic examinations (including speculum examination of cervix) are performed but are usually unremarkable. Uterine tenderness may be present. Note: Dysmenorrhoea may resolve following pregnancy. Non-gynaecological differentials include inflammatory bowel disease and irritable bowel syndrome. Fig 2 – Pelvic inflammatory disease refers to infection of the upper female genital tract. It is a cause of secondary dysmenorrhoea. No investigations are specific to primary dysmenorrhoea and therefore the work up is focused on ruling out underlying pathology. If the patient is at high risk of a sexually transmitted infection, then a high vaginal swab and endocervical swabs are indicated to screen for underlying infection. If on examination a pelvic mass is palpated, a transvaginal ultrasound scan (TVS) should be performed to investigate further. As there is no pathology to treat in primary dysmenorrhoea, the aim is a symptomatic improvement. Stop smoking (there is a clear relationship between smoking and dysmenorrhoea). NSAIDs (ibuprofen, naproxen, mefenamic acid). They work by inhibiting the production of prostaglandins; which have been implicated in the pathogenesis of primary dysmenorrhoea. Monophasic combined oral contraceptive pill is most commonly used first line. Intrauterine system (e.g Mirena coil) may also be effective. Primary dysmenorrhoea refers to menses pain in the absence of an underlying pelvic pathology. Prostaglandins released stimulate myometrial contraction and spiral artery vasospasm causing ischaemia of the secretory layer of the endometrium. It typically has a good response to COCP and NSAID therapy. Which chemical mediator has been strongly implicated in primary dysmenorrhoea? Which of the following symptoms would NOT be expected in primary dysmenorrhoea? Which of the following treatments for primary dysmenorrhoea work via inhibition of prostaglandin synthesis?